Structure & Function: How Organisms Live, Behave, Reproduce, Grow Science Stations for Fourth Grade Next Generation Science Standards include 8 different science stations where students deepen their understanding of internal and external structures and functions of plants and animals that support survival, growth, behavior, and reproduction. 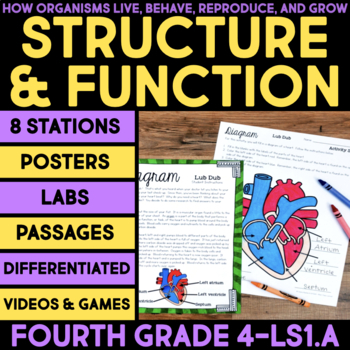 The focus is on 4-LS1.A and includes concepts such structure and function of flowers, belly buttons, muscular and skeletal systems, bird structures to support flight, the human heart, trees, animals in arctic areas, leaves, and other organisms. All stations in this set meet the DCI, helping students gain an understanding of the biological principle that “form fits function,” or organisms’ structures are necessary for survival of the organism and of the species. The Investigate and Model stations go into more detail and help students construct arguments that specific structures are necessary for specific functions in the organism’s life, as outlined in the Performance Expectation. ► Vocabulary Cards in two formats with and without pictures. ► Watch - Students watch one of two videos and then answer questions about the videos. Videos include: the structure and function of flowers and the structure and function of belly buttons. ► Play - Students play a video game and learn about the structures and functions of the muscular and skeletal systems or the structures and functions of plant growth and reproduction. ► Investigate - Students read about bird structures which suit them for flight. They examine a bird femur, sternum, and feather. Students then answer questions to reinforce the concepts learned. ► Diagram - Students read about the human heart. Students fill out a diagram of the human heart and answer questions in order to reinforce what they have learned. 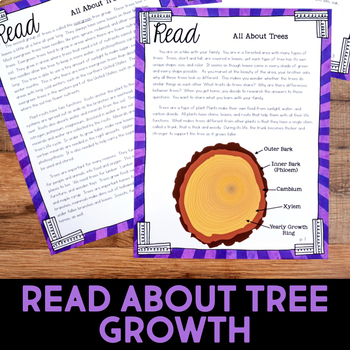 ► Read a Passage - Students read about trees and learn how structures are adapted for their functions. They answer questions in order to reinforce what they have learned. ► Model - Students read about structures and function that enable some animals to live in arctic environments. They do an activity that models structures of these animals. They answer questions in order to reinforce what they have learned. ► Explore - Students read about structures and functions of leaves in order to explore photosynthesis. They answer questions in order to reinforce what they have learned. 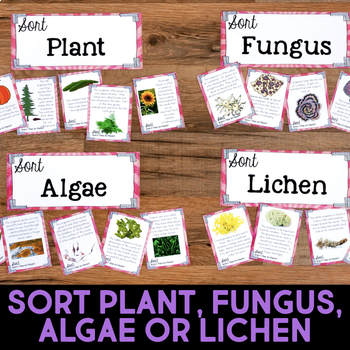 ► Sort - Students read about plants and organisms that are commonly mistaken as plants. They sort the organisms into their kingdoms. Students then answer questions in order to reinforce what they have learned. Each station includes four different ways to respond to the experience at the station: short answer questions, fill-in the blank questions, task cards with short answers, task cards with multiple choice. All the variations are similar to one another. Choose the format that best fits your classroom and students. Students are encouraged to use their science journal, but worksheets are included as well. Some stations include two or more activity choices and extension activities. Each station is designed to last about 15-20 minutes. Students may do one a day for 8 days, 2 a day for four days, or any format that works for your classroom. Because there are additional activities for the Watch and Play stations, you can offer those as a choice within that station or offer them as an early finisher station, as well. See the preview for additional information and details. Additional Science Stations are also available. Look for the green star near the top of any page within my store and click it to become a follower. You will now receive customized email updates about this store. Copyright © Jessica Boschen. All rights reserved by author. This product is to be used by the original downloader only. Copying for more than one teacher, classroom, department, school, or school system is prohibited. This product may not be distributed or displayed digitally for public view. Failure to comply is a copyright infringement and a violation of the Digital Millennium Copyright Act (DMCA). Clipart and elements found in this PDF are copyrighted and cannot be extracted and used outside of this file without permission or license. Intended for classroom and personal use ONLY.